School starts in 2 weeks. I am in denial. I’ll have two of my kiddos going this year – excited, but sad too! We are squeezing every last drop out of our summer break and trying to cram in all the last bits of fun and freedom – including doing a little cupcake decorating. Does it count as decorating if you eat most of the toppings before they make it to the actual cupcake? If you love lemon (hence the name) you will love, love these babies. Grease and dust two 9″ round cake pans, or line cupcake cups with paper liners. Rinse lemon and pat dry. Grate enough zest to measure 2 tsp. Set 1 tsp of zest aside for frosting. Cut lemon in half and squeeze out the juice – you will need 1 Tbsp plus 2 tsp. 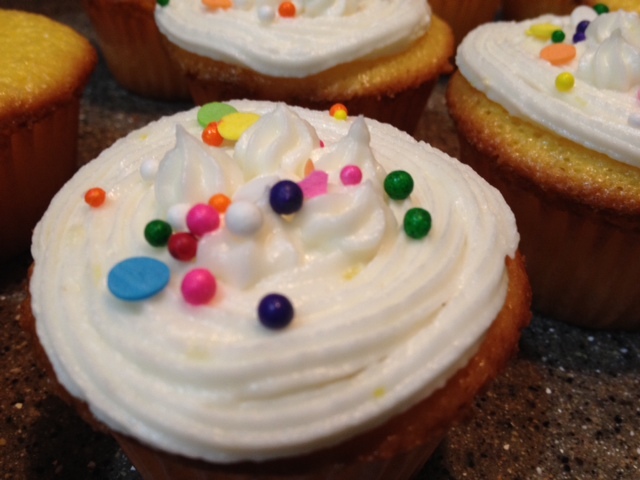 Set 2 tsp of lemon juice aside for frosting. Place cake mix, pudding mix, yogurt, water, oil, eggs, 1 tsp lemon zest, and 1 Tbsp lemon juice in a large mixing bowl and beat until well blended. Divide the batter between cake pan, or fill cupcake liners with 1/4 cup of batter. 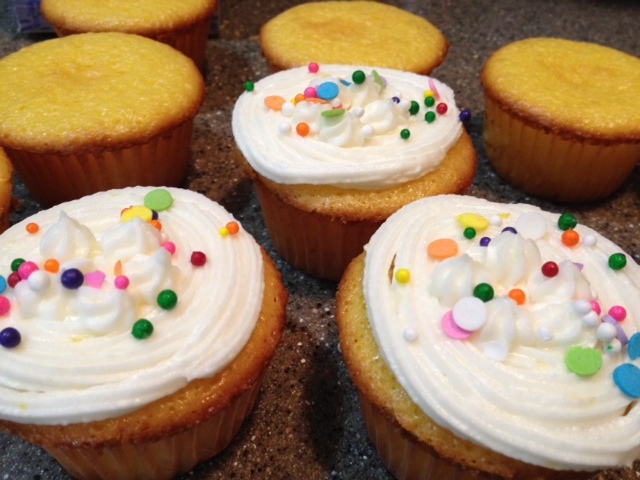 Bake at 350^F for 25-30 minutes for cakes or 20-25 minutes for cupcakes. Bake until golden brown and the top springs back when lightly pressed with a finger. Allow to cool completely before frosting. Place the cream cheese and butter in a medium bowl and beat until creamy. Add 2 cups of powdered sugar, 1 tsp lemon zest, and 2 tsp lemon juice. Beat until will combined. Add 1 1/2 cups of the remaining powdered sugar and beat until smooth. Continue to add powdered sugar until desired consistency is reached. I think I’ve discovered a new species of fly. I call it: the Hydra-House Fly. I swear, for every fly I swat, three more take its place. Where are they coming from?!!!! Flies are, unfortunately, a part of summer. Especially in my house, where it is (apparently) physically impossible to close the door behind you. That’s the bad part of summer. The good part? 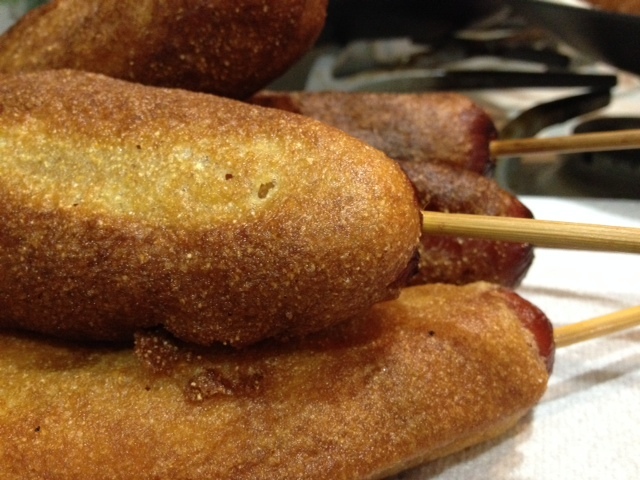 Sunshine, swimming, picnics…corn dogs. This recipe comes from my Grandma. The batter makes for a lighter corn bread that is airy and crispy and all around uber-tasty. Mix dry ingredients. Cut in shortening. Add milk and ddd. Stir to remove lumps. 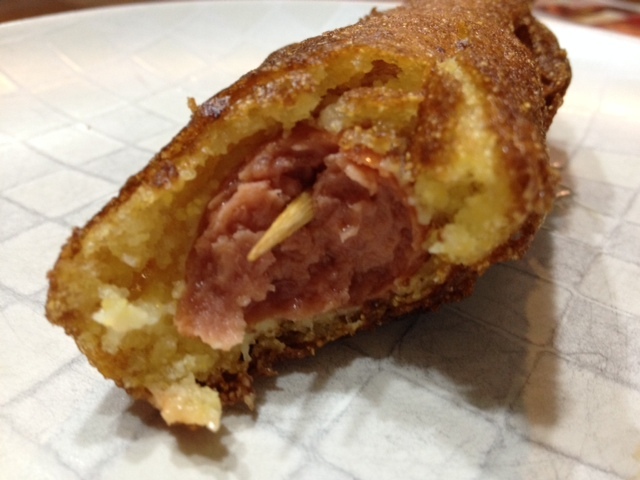 Skewer hot dogs and dip into batter. *Tip* Fill a drinking glass with the batter and dip the hot dogs down into the cup for better coverage. The batter will also adhere best if hot dogs are completely dry. Fry in oil until golden brown – about 2 minutes. I am ignoring my laundry…for another 5 minutes. If I ignore it much longer, it will most likely explode all over the house. 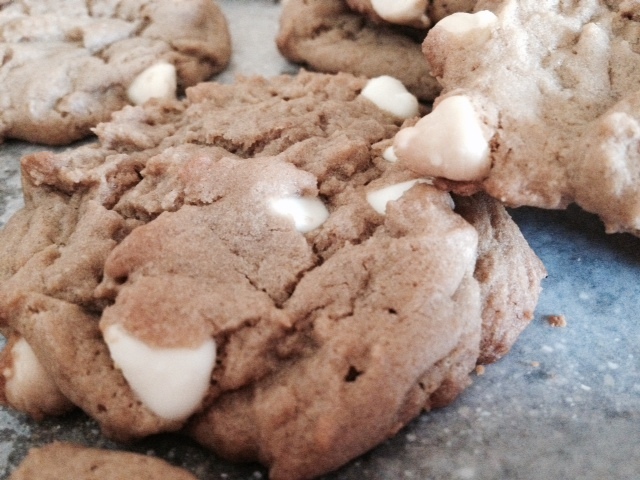 These cookies are pretty darn awesome. 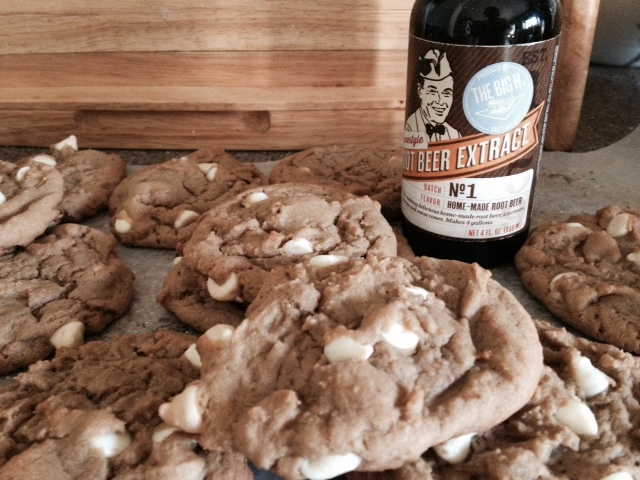 They aren’t crazy-full of root beer flavor, but have that creamy taste of a float. Perfect for a summer treat. Beat in instant vanilla pudding mix well. Add eggs and root beer concentrate and beat until well incorporated. Add flour and baking soda and beat until well incorporated. Roll into 1″ balls and place on greased cookie sheet.